Thank you to Dr. Christina Fuocco from Whole Animal Gym in Philadelphia for this case study. Bandit is a 9-year-old male Rottweiler who came to WAG starting in July of 2015 for hind limb paraparesis. Prior to his injury, Bandit was fully ambulatory, had no other known health concerns, and took frequent walks around the block and in the park with his owner. On June 30th, 2015, the owners heard a yelp from Bandit and found him lying on his side, unable to stand. Bandit’s owner is in a wheelchair and had a mobile veterinarian come to the home to look at him. Thoracic radiographs were generally unremarkable and revealed only moderate hepatomegaly. Bandit was placed on a course of Prednisone and an MRI was performed on July 23rd. Bandit’s MRI revealed mild spinal cord compression at C2-C3 secondary to spinal stenosis and a moderate right-sided disc herniation at T13-L1. These changes appeared to not be severe and may have been present for some time. It is possible another vascular event, or a fibrocartilaginous embolism (FCE) occurred which was not revealed on the MRI, and the C1-C5 myelopathy was contributing to his weakness. Bandit was ambulatory with assistance with upper motor neuron tetraparesis with ataxia affecting the hind limbs more severely than the front. Bandit had normal withdraw responses in all four limbs and a normal perianal reflex. Bandit’s hind limbs were very delayed during assisted ambulation, with the right hind leg being affected worse. Bandit showed no improvement on steroids and was weaned off of the Prednisone and recommended by Neurology at VSEC for physical rehabilitation at WAG. Bandit was first seen at WAG on July 28, 2015. Because of Bandit’s owner’s unique situation, transportation to and from WAG for physical therapy was very challenging. Often the owner would rely on pet taxi services, but finding a reliable transportation method proved frustrating. Several changes were made to his medications and at-home exercises were prescribed. Bandit was a difficult patient and would frequently try to bite. Initially, we attempted hydrotherapy in the underwater treadmill for Bandit. A life vest was placed on him, but Bandit refused to move his legs in the water. Several hydrotherapy sessions were attempted with minimal progress. We added in acupuncture sessions, but saw very little immediate results from the treatments. With the owner’s difficulties getting Bandit to WAG, an at-home physical rehabilitation plan was implemented in November of 2015 having a technician go to Bandit’s house for in-home therapy. Bandit’s home was very crowded, so we worked mostly in the small back yard, doing assisted walks with a Help Em Up Harness. Bandit knuckled frequently on the front end and needed more assistance in the hind end. Since Bandit’s owner was in a wheelchair and lived with her elderly mother, they were unable to get Bandit in a standing position on their own. The technician visits were the only time Bandit was able to get up in a standing position each week. We had several setbacks over the next few months as the owners had a whole in their roof which prevented access to the outside yard. Bandit had a mass removed from the left tarsus which biopsy showed to be a spinde-cell carcinoma. Bandit completed a radiation therapy regimen but lost a lot of strength with the setbacks. We approached the owner in February 2016 about the idea of trying a Walkin’ Wheels four-wheeled cart to help Bandit be able to work on strengthening and conditioning at home. Bandit’s first attempt in the cart was short but encouraging. He was able to complete roughly a 40 foot walk before fatiguing. 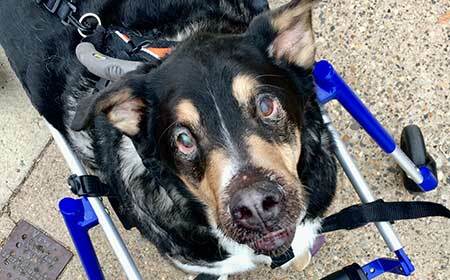 We began scheduling weekly at-home visits to help the owner get Bandit up and into his cart. Bandit’s progress since has been great. Through continual weekly strengthening through use of his cart, he is able to now complete two city-block length laps around his neighborhood each visit. The owner continues to work with him through exercises, but has been elated with his progress. The Walkin’ Wheels cart has been the only treatment that has worked for Bandit. It has provided him the opportunity to enjoy the outside environment again and has greatly improved his quality of life.